Like so many families I am always looking for ways to not only save money on meals but also streamline the whole process of meal planning, grocery shopping and of course, meal prep. And now that I am a member of Once a Month Meals I am really looking forward to filling my freezer with delicious and nutritious breakfast, lunch and dinner menus. while the pro costs $16 a month or $170 a year. Both memberships give you the ability to choose from various types of meal plans as well as shopping lists, recipes cards, cooking and freezer instructions, labels and more. The pro membership offers everything that the basic membership has to offer but allows you to mix and match between different menu plans. Update: As of now there is just the pro membership available. The cost is still $16 a month and if you join for a full year you get one month free. What I really like about Once a Month Meals is that there are menu plans to fit just about any lifestyle. The choices include traditional, whole foods, paleo, gluten/dairy free, vegetarian, diet, mini menus and even baby food menus. I just became a member myself so I have not had the opportunity to make any of the meals yet. However, I am now in the process of planning my menus. I like that these menus include breakfasts, lunches and dinners. In my own household our breakfasts and lunches are pretty simple but I cook a fairly big dinner in the evening. With this plan I can serve homemade meals more than once a day if I choose but what I will probably end up doing is using some of the breakfast and lunch menus at dinner as well. There are many tasty menus to choose from. 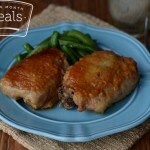 For example some of this month’s recipes include cherry maple muffins, honey pork chops and slow cooker orange chicken (yes, even crock pot meals are included). I look forward to sharing my results in a future post but I can already tell that I am really going to enjoy cooking once a month and the meals listed look simple yet delicious. 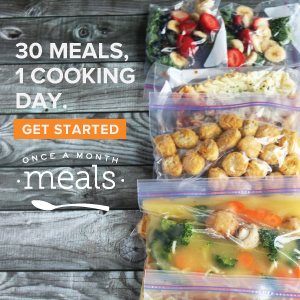 If you would like more information on cooking delicious and nutritious freezer meals with Once a Month Meals then click here to get started. 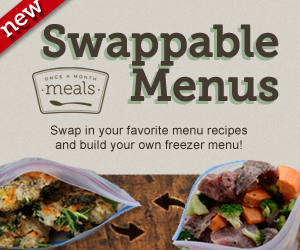 Please note that I am not just a member of Once a Month meals (OAMM) but also an affiliate. If you purchase the OAMM membership through my blog your cost will be the same but I make a small commission, which helps cover the costs of maintaining this blog.